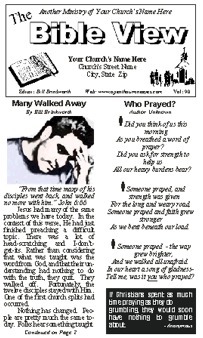 Sign-up for the Bible View - Home Edition — the e-mail version of thisnewspaper! "God Gave", "Keep Christ in Christmas", "What Do People See in You? ", "What REally Did Happen on the First Christmas?" "We're All Sinners", "Sin, the Tyrant", "Sin, the Deceiver", "Curse of Sin", "Deceitfulness of Sin", "What Forgiveness Did"
"Safe, Close to Jesus", "Be Not Afraid", "When Fear Is Sinful", "Fear of God", "Psalms 37:3-7", "Made in God's Image"
"Why Me? ", "God Knows the Way", "'The Bad' Times", "In Moody's Bible"
Good works will not save anyone! "I Should've Done It Right the First Time", "A Better Work", "A Child's Song", "Obey God"
"Working with the Boss", "You Do a Great Work for the Lord", "Keep On Keeping On", "The Faithful Teacher", "The Deer Hunter"
"To Judge or Not to Judge", "Would You Dare?" "God's Toolbox", "Do What You Can", "God Uses the Faithful"
"Who Is Your Leader? ", "Don't Go Back! ", "Hymn Writer Loses Joy of Salvation", "Degrees of Backsliding"
Kindness & Commemorating the 300th Bible View! "Not Just a Man", "The Prophesied One", "The Door", "Who Jesus Is", "What Christ Is to the World"
"Saved for Sure! ", "Salvation, Not by Good Deeds", "Salvation by Faith and Grace", "Faith and Reason"
"Should a Christian Tolerate Sin? ", "Too Late", "The 'Insulted' Man", "You Are Not Alone"
"Waivering Faith", "A Dirty Telescope", "Faith Training", "Jumping into Father's Arms", "The Reflecting Waters", "Dead Faith", "Christ, Our Guide"
"Home of the Lost", "Warnings! 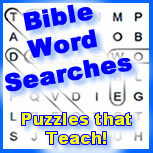 ", "Where Hell Is"
Sign-up to receive an e-mail to read and study one chapter of the Bible a day!